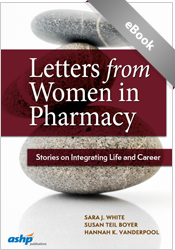 This Letters publication was stimulated by the ASHP 2016 Women in Pharmacy Leadership Steering Committee recommendation to ASHP: Proactively collect and share stories, case studies and scenarios of how women have addressed gender, workplace, work-life integration, and leadership challenges. The power of this publication comes from each person’s specific journey all unique but similar in reaching for their potential as both a pharmacist and woman. It emphasizes the multiple successful approaches to blending a career and personal life. For help on a variety of ASHP Store topics, like shipping rates and technical problems, please visit our Help and Support Center. © 2019 American Society of Health-System Pharmacists. All Rights Reserved.